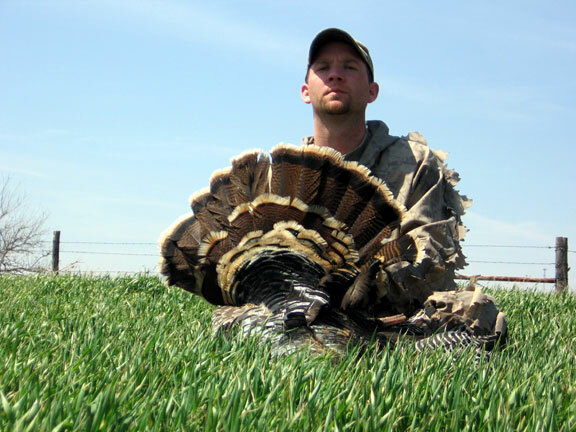 Kansas Rio Grande Turkey hunting is new to many turkey hunters. Including those who make Kansas an annual spring season hunt. Until their discovery of Mid-America Hunting Association most never having previously considered Kansas as a Rio Grande option. 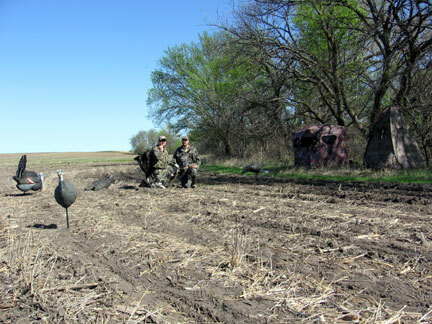 Western Kansas Rio Grande Turkey hunting requires different tactics than woodlot turkey hunting. One more challenge to change up any routine associated with spring season. Our attempt to remove as much Kansas Rio Grande turkey hunting mystery as is possible. That is as much as text and pictures can. We present in great detail Kansas’ Rio Grande Turkey in pictures within their habitat so as to “break in” a first time Kansas Rio Grande hunter. We will also recommend right to numbered properties posted to MAHA maps where we have seen Rios. All this is meant as a jump start. 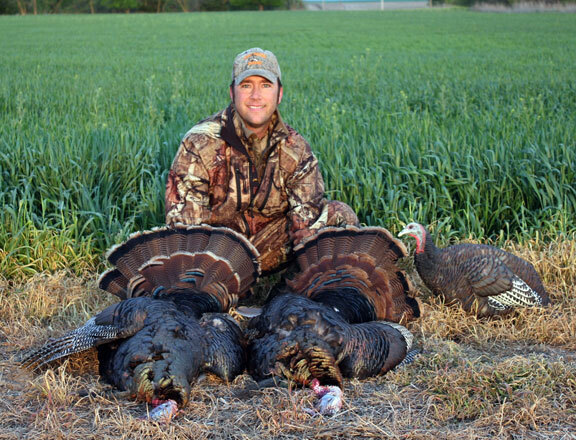 Most do it yourself turkey hunters once breaking into an region will quickly take subsequent hunts or scouting trips on entirely their own accord. Jeremy, his second spring season ever – anywhere. Kansas wheat country. Rio Grande Turkey roam long distance in large wild flocks. They cover far more ground than do Eastern’s. Any first setup is is best after narrowing down a roost, flydown and common travel direction. Travel direction changes as frequently as daily. This may require a change in set up from morning to afternoon that involves miles of movement. However, to hunters’ advantage it seems form years of experience Rio toms do come to call easier. Large flock comments have drawn criticism from some who live in more well known Rio Grande Turkey states. 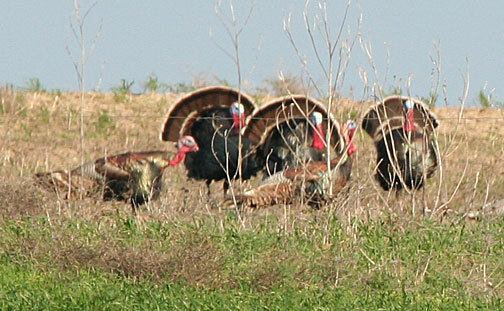 However, members who tell how on a good day in these states they may see three turkeys. Kansas flocks have been regularly seen to number past 100. They are typically above 50 birds. Kansas wild Rio Grande Turkey is frequently around grazing animals. Deer often may be seen in and around flocks. Our experience has shown Rios simply does not care what animal is around it deer, cattle or dog. Not until being pressured by a dog running full tilt right at them do they flush like quail. A bird dog working edge within sight of a Rio flock will get a flock’s attention. But will not push them to flight. This is much different than our Easterns where any turkey, single or flock, once flushed would fly across the valley to a far ridge completely safe by distance from pursuit. Upland bird hunters frequently tell of seeing a Rio flock with it keeping about a 100 to 200 yard distance from hunters even with dogs running about. Bird dog owners will tell further how a flock which is heavily pressured by a surprised appearance of a dog will stand still or mill about before giving to run or flight. Such bird dog to Rio Grande Turkey encounters frequently have the dog within a flock before flight. What this tidbit brings hunters is comparatively the Rio Grande Turkey seems easier to bring into shooting range than an Eastern. Or, Rios seem to be far more forgiving of hunter mistakes. 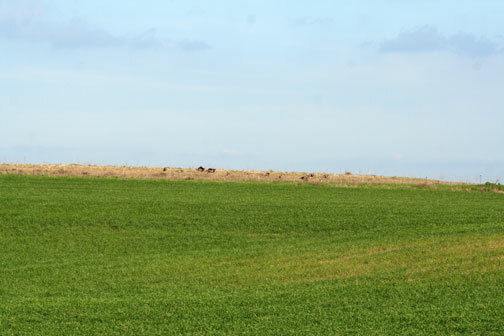 This continues as a cattle filled pasture does not degrade any lease’s potential. That last point about cattle will serve many hunters as Rio Grande Turkey range overlaps heavily with Kansas pasture country. The point being is hunt where any Rio Grande Turkey may be scouted. Do not discount a lease due to preconceived habitat ideals.